Family firms are different, a real force for good and that can only be a good thing. The obvious thing that makes family businesses stand out from their non-family counterparts is the ‘family factor’ and this is something that can be used to the competitive advantage of the business if harnessed in the right way. Sadly, all too often family business is portrayed as ‘small business’ rather than the reality that those in the know understand: family firms can be big business, take JCB, Wal-Mart, BMW, ALDI and many others and the myth has been blown away, but fundamentally it is more important that family firms are recognised for the positive values they bring to the economies and communities in which they operate. Rather than focusing on the sensational headlines around sibling disagreements, nepotism or intergenerational issues there are real positive attributes possessed and demonstrated by family businesses the world over on a daily basis which helps to show that family firms are a real force for good too. Family firms are generally seen as good employers, trusted and respected businesses, even more so when the family name is above the door and the business has been around for generations and the benefits associated with being a family business can be great. These benefits can even result in the family business deriving competitive advantage as a result. 1.Values – Family values can be translated into the way that the business operates, the culture of the family firm, and these can be passed from generation to generation as well as from family members to other employees. There is an immense level of pride amongst family members to respect the business, their predecessors and in many cases to act as stewards to pass on the business to the next generation and the values that underpin the family and the family business add to the essence of the family firm. 2.Long Term View – Family firms are recognised for taking the long term view, not always focusing on the short term financial performance and results of the business. A patient and often cautious approach can help to align resources and plans too. 3.Loyalty – Research has proven that shared values and vision amongst family members with clear and open communication of their goals and objectives can result in greater loyalty from family members too. 4.Retention – Employees of family firms are often cited by the family as an ‘extension of the family’ or as part of the ‘extended family’ and consideration and support of employees to such an extent can provide an incredibly loyal workforce who enjoy the work environment, the support of the family and the way that they are treated. 5.Legacy – Making a difference and creating a legacy is something that can come from a family in business and there are lots of examples where family firms are integral to the community in which they operate. Building on the efforts of previous generations and continuing the family tradition, protecting the name and the values that it upholds are also drivers for subsequent generations to continue in the same manner and to continue to give something back. 6.Trust & Integrity – Research has proven that the very nature of the family ownership can engender more trust from stakeholders and customers alike, and more and more family firms are celebrating their history and legacy in the brands that they are developing, recognising that it can be to their competitive advantage. 7.Innovation – Due to their governance and ownership structures family firms can be more innovative. In many cases, they recognise the need for innovation as part of their strategic planning to keep the business relevant and current and as such are able to respond to change and take on opportunities as they arise more quickly than some of their non-family counterparts. 8.Entrepreneurship – Successful family firms can be a breeding ground for entrepreneurship, supporting the next generation in their pursuit of new opportunities, either through opportunity, training, career progression or encouragement. 9.Respect – Many family firms are massively involved in their local communities and give back in many ways which engenders significant respect from the communities in which they operate. 10.Relationships – Whilst it may not be seen as the ideal situation for some, families that work successfully together get to spend more time together and sharing a drive towards goals for the business can be a bonding and fulfilling journey. Successful family firms reap the benefits and have structures in place for clear and effective communication, helping to minimise the risk of disagreements or conflicts arising. This enables them to focus on the business, with shared goals and commitments to getting the right results and without any doubt, when it all comes together, family business is different but can be a resolute force for good and secure competitive advantage too, further generating better financial results and performance that is of benefit in the long term too. 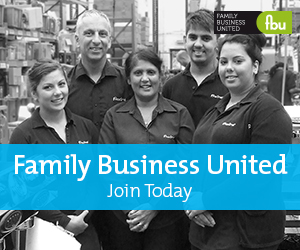 Celebrate the strengths of family business. They are a force for good and provide significant benefits to communities around the world.